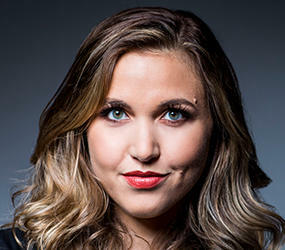 Taylor Tomlinson is one of the country’s youngest touring headliners, delighting audiences coast-to-coast with her sharp crowd-work, biting wit, and wonderfully self-deprecating point of view. She has been featured on The Tonight Show Starring Jimmy Fallon, Conan, MTV’s Safe Word, Comedy Central’s Adam Devine’s House Party, and was a finalist on season 9 of NBC’s Last Comic Standing. Taylor co-hosts The Self-Helpless Podcast and can currently be seen on Netflix’s stand-up series The Lineup.